^ Cheshire Cat. Alice-in-Wonderland.net. [2018-05-15] （美国英语）. ^ 卡羅爾. 愛麗絲漫遊奇境記. 北京: 連環畫出版社. 2006年6月. ISBN 7-5056-0600-X. ^ 3.0 3.1 《愛麗絲夢遊仙境》極富魅力的角色們，可能的現實人物原型是誰？. The News Lens 關鍵評論網. 2016-08-04 [2018-05-15] （中文（台灣）‎）. ^ 斯蒂芬·薩爾維亞蒂. 100隻傳說中的貓. 臺中: 晨星. 2006年4月: 100. ISBN 986-177-003-8. ^ 幸佳慧. 掉進兔子洞：幸佳慧帶路，跟著經典童書游英國. 臺北: 天下. 2012年8月. ISBN 978-986-241-578-8. 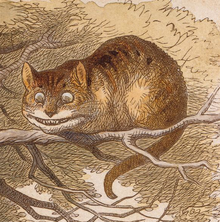 ^ The Cheshire Cat (Character). IMDB. [2018-05-29]. （原始内容存档于2017-04-09）. ^ Tim Burton says hello kitty: ‘The Cheshire Cat taps into…my hatred of cats’. Los Angeles Times. 2010-02-16 [2018-05-29] （美国英语）. ^ Alice's very weird wonderland: Why a behind-the-scenes row might see Tim Burton's most fantastical film yet disappear from cinemas as fast as the Cheshire Cat. Mail Online. 2010-02-20 [2018-10-07]. ^ (6042) Cheshirecat = 1990 WW2. 小行星中心. [2018-10-07] （英语）. ^ (6042) Cheshirecat. Dictionary of Minor Planet Names. Berlin, Heidelberg: Springer Berlin Heidelberg. 2003: 505–505. ISBN 9783540002383. doi:10.1007/978-3-540-29925-7_5607 （英语）.